Food bloggers Antaraa Roy Choudhury, Sanjukta Dutta, Geeta Dutta and Rimzim Lahkar at the meet. 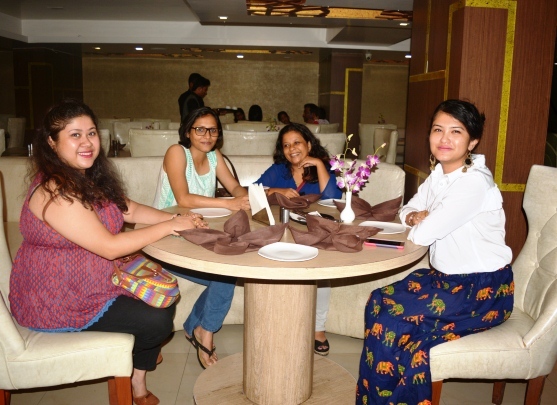 Shahi Darbar, a Guwahati based popular and exquisite pure vegetarian restaurant organized a food bloggers meet for a food testing session recently. Food blogging represents a complex interweaving of “foodie” or gourmet interest in cooking with those of blog writing and photography. Eminent food bloggers and reviewers were invited to attend the event. The event was attended by Sanjukta Dutta, food consultant and restaurant reviewer, Geeta Dutta, food recipe developer & columnist, Antaraa Mahanta Roy Choudhury, food blogger and Rimzim Lahkar, food blogger. The bloggers event was organized and managed by Sportscraft Management. “One thing that we must not negate is the fact that Vegetarian Cuisine has every texture, every flavor and every aroma that can beat any other non vegetarian cuisine any given day in time. If I have to describe the place then I would choose to point out that the place is tastefully done and well lit,” says Sanjukta about the place. Located at Ganapati Plaza, Fancy Bazar, Shahi Darbar is in its 5th year since inception. Known for its quality and taste, they were awarded with the “Most Promising New Entrant” in its first year and living up to the expectations it is also a proud winner of Guwahati Food Awards with the title of “The Best Veg Restaurant of the Year” for the last three years consecutively. “It was a great experience to host the first of its kind bloggers table and we are very happy to have the leading food columnists of the city,” says Vivek Agarwal, owner, Shahi Darbar. “We consider this as a self-evaluation and great learning experience. We believe that review and feedback from the bloggers will upgrade the quality of Shahi Darbar’s food and services. This festive season we invite all the Guwahatian’s to visit and experience its wide range of vegetarian cuisines,” he says.